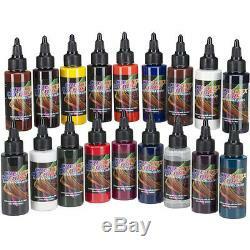 18 Color Illustration Color Wheel Airbrush Paint Set, 2 oz. Createx Illustration Colors are refined, water-based airbrush colors optimized for use with Dru Blair's Color Buffer System. Illustration Colors offer true fine-line, detailed performance while allowing for re-wettable techniques and soft erasing. As the name implies, Illustration Colors are designed with the illustrator and fine artist in mind without catering to the demand for high coverage, base colors. We use the same exterior-grade pigments we use to make our Wicked Colors and Auto Air Colors. Note: Monitors vary - onscreen colors are for general color reference only. Createx Illustrations Colors For the illustrator and fine artist. Createx Illustration Colors are a refined, water-based airbrush colors optimized for use with Dru Blairs Color Buffer System. The difference is in the resin. Unlike Wicked Colors and Auto Air Colors which air dry to a cured, non-soluble coating, Illustration Colors are re-wettable with an amine such as Windex. This is one of the key characteristics behind the creation of our Illustration Colors. Another key characteristic this resin offers is soft erasing. Unlike our Wicked Colors which erase hard, Illustration Colors are very easy to erase within the first 48 hours after application. After 48 hours, Illustration Colors harden making erasing more difficult and similar to how our Wicked Colors erase. Illustration Colors are lightfast and made with the same exterior-grade pigments used to make Wicked and Auto Air Colors. The difference is the resin. Illustration Colors have a unique feature called delayed cross-linking. After applying, colors are easy to soft-erase and manipulate during an open window of 48 hours, after which colors dry to a hard durable coating that is not water-soluble. Artist can work without limitations no matter what the substrate: canvas, illustration board, hard surface, and more. Illustration colors are for use with small airbrush-tip sizes, straight from the bottle. You may also choice to reduce for more transparency. You may choice to reduce with any of the two recommended reducers, 5091 Illustration Reducer. Or w500/4012 High Performance reducer. 5091 Illustration reducer thins colors while allowing for the delayed cross-linking effect. When using W500/4012 High Performance Reducer, Illustration Colors cure to a hard, durable coating without the delayed cross-linking effect. San Diego, California South Carolina. The item "18 2oz Createx Illustration Color Wheel Set Airbrush Paint Color 5080 00" is in sale since Tuesday, December 01, 2015. This item is in the category "Crafts\Art Supplies\Painting Supplies\Airbrushing Supplies\Systems & Sets". The seller is "tcpglobal" and is located in Duncan, South Carolina. This item can be shipped worldwide.